In this police dashcam video, former officer Marco Proano is seen firing into a car of unarmed teens, wounding two. A witness to a 2013 police shooting that resulted in a six-figure settlement with the City of Chicago says she was detained by officers and prevented from talking to reporters at the scene about what she saw. Asiah Clark, who watched as a police officer shot 16 times into a car full of unarmed teenagers, has sued the city for violating her First Amendment right to free speech. The shooting was captured in a dashboard camera video that went viral last year. Her account of how she was treated is reminiscent of those of witnesses to the shooting of Laquan McDonald, who told lawyers for his family that they were threatened by officers, and it raises questions about whether Chicago police engage in a pattern of silencing witnesses to police shootings. Clark appears to be the first to sue the city over this issue. She was driving near 95th and LaSalle streets on Dec. 22, 2013 when Officer Marco Proano began shooting into a car full of teenagers on a joyride in a stolen car, injuring two of them. Her black Pontiac Vibe can be seen in the dashboard camera video of the shooting, which the Reporter obtained from a retired Cook County judge last year. She was forced to quickly put her car in reverse to avoid getting hit by the officer’s bullets and the teens’ car and ended up crashing into a parked car. Clark, whose insurance had lapsed, has to pay more than $10,000 out-of-pocket for damage to the parked car, her lawyer said. After the shooting, a TV reporter approached Clark. She agreed to be interviewed, but before she could tell the reporter what she had seen, an officer swept her away. “He let it be known that I wasn’t going to be talking to this reporter, and that was that,” she said in an interview last week at her lawyer’s office. He then took her to a squad car and had her sit in the backseat for about 20 minutes, she said. Clark doesn’t know the name of the officer who sequestered her; the lawsuit names eight officers who were at the scene. She wasn’t told to change her story, like witnesses to McDonald’s death said they were. But she was so frightened by the experience that she moved to Carbondale, where she had attended high school, shortly after the incident. After she saw the video of the shooting on Facebook, she finally felt safe to come forward, she said. In late December, she filed a lawsuit in federal court against the city and the officers who were at the scene for excessive force, violations of her First Amendment rights, and unlawful seizure. She is asking for unspecified compensatory and punitive damages. Tim Fiscella, who represented the teenagers who were injured in the shooting, is Clark’s attorney. In July, the City Council approved a $360,000 settlement for the teenagers, of which Fiscella and his co-counsel split $144,000, according to court records. Fiscella said Clark’s First Amendment rights were “pretty seriously compromised in a punitive fashion” and that she has a strong case. Within a week of the shooting, Clark said, she was interviewed by an investigator from the Independent Police Review Authority. After that, she never heard anything else about the case, she said. More than 760 days have passed since the shooting, almost twice as long as the time between McDonald’s death and the indictment against Officer Jason Van Dyke. Yet the IPRA investigation into this shooting is still ongoing. Larry Merritt, a spokesman for the agency, wouldn’t say why the investigation is taking so long, only that every case is different. The Cook County State’s Attorney’s Office decided in August 2014 not to bring criminal charges against Proano, according to a spokeswoman. The Chicago Sun-Times has reported that the FBI is investigating the shooting, but a spokesman for the U.S. Attorney’s office would neither confirm nor deny if federal civil rights charges will be filed. 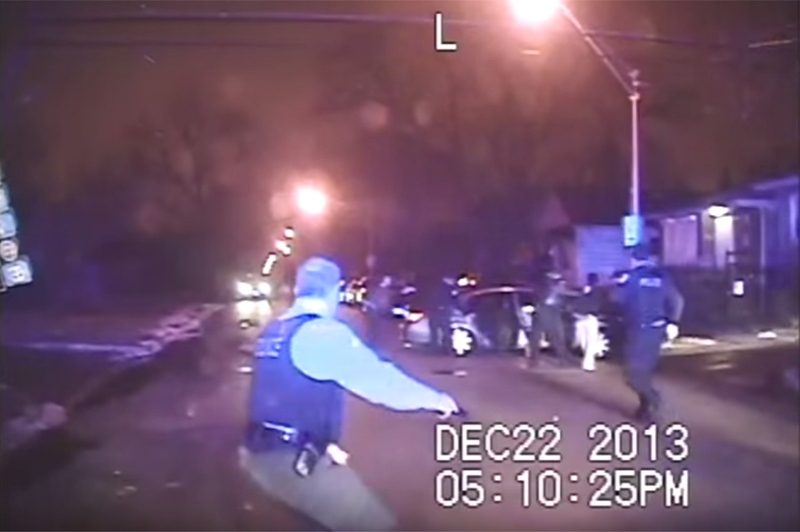 City officials’ responses to the fatal shooting of 17-year-old Laquan McDonald expose systemic failures in police accountability.